Today, Logistics & Distribution solutions have gained importance in different other sectors like customs, wholesaling, exports, import, manufacturing and most significantly transport businesses. Due to the growing intricacies of delivering commodities to the target areas in a globalized supply chain, the concept of logistics as a business came up. For business houses, it basically includes implementing and planning activity forecast regarding an efficient supply chain management based on market trends and statistics. Since transportation and delivery of goods is the key element of the logistic process, it also provides a cost effective yet result oriented transportation strategy. 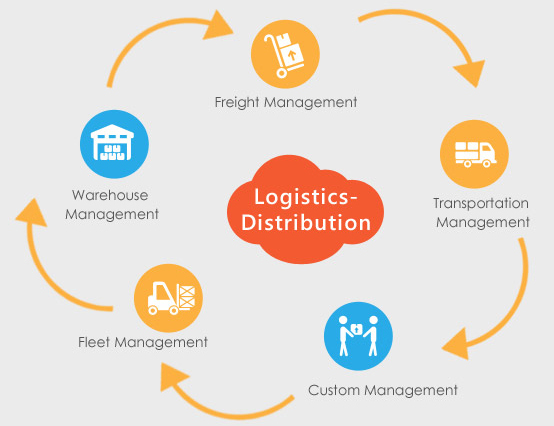 Swash provides most advanced cloud based Logistics & Distribution solution “KENLogistics™” which strengthens, resolves and simplifies supply chain management. It aims to improve the cooperation between providers, companies and clients involved in the logistic process also between the agents entailed. Simple flow of information between the various functions like customs clearance, freight forwarding, warehousing and transportation and from thereafter to accounting provides the company with complete visibility required to control costs and create strategies. Demand & forecast planning, production planning, capacity planning along with vendor management are some of the basics of this solution. To get more details about our KENLogistics™ product, please click here. By providing assistance to any company in taking timely decisions so that they can their supply chain and logistics, KENLogistics™’s comprehensive business management capabilities is built to reduce costs, optimize the functioning and operations of the any company having logistics channel. Our advanced delivery models and technological process provides an extra edge to the educational industry to be ever profitable and ready for every challenge which the industry faces time and again. To get more details about Swash's technological platform, development and models, click here. Logistics & Distribution solutions include planning, implementing and controlling the functions of warehousing, inventory, distribution and transportation. It consists of all activities and software systems that facilitate a company to transfer finished goods and raw materials from one location to another. The implementation of ERP in logistics strengthens the cooperation between clients, companies and providers involved in the logistic process. The communication improves the coordination of the agents entailed. KENLogistics™ helps you with transport management, warehouse management system and fleet management system. With transport management system you can easily manage your transport rate, make airline, carrier booking, and shipping, manage delivery, vehicle tracking etc. Our warehouse management system facilitates you with yard management, resource management, inventory tracking etc. With our fleet management system you can track asset details, perform breakdown maintenance, fuel and tyre management and many more. KENLogistics™ provides complete solutions for various industries. Here the key features of our Logistics & Distribution software. KENLogistics™ helps you with Freight management. This important feature helps sustaining warehouse inventory levels, maintaining accurate records and controlling cost. This feature of KENLogistics™ helps in freight bill auditing, inbound and outbound shipment scheduling, transportation mode selection, managing shipping units, payment and processing of loss and damage claims etc. This is ideal for automating, improving and streamlining the delivery and inbound-shipping process. Warehouse management system facilitates you with yard management, resource management, inventory tracking etc. This allows a much more efficient process from the ordering of goods to logistics management and beyond. Fleet management is vital for any business dealing with vehicles. With fleet management system of KENLogistics™ you can track asset details, perform breakdown maintenance, fuel and tyre management and many more.